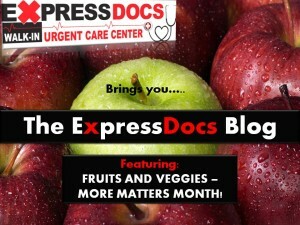 Home › The ExpressDocs Blog › Health Awareness Initiative › Fruits and Vegetables – More Matters Month! September is Fruits and Vegetables…More Matters Month! That means that one of this month’s health awareness campaigns has been designated to increase the fruit and veggie intake we consume daily. A vital part of fighting obesity and living healthy lifestyles is ensuring ourselves and our friends and family consistently consume the nutrients needed to live a happy and healthy life. Pasta, pretzels, chips, meat and cheese are misconstrued as food mainstays since they are routinely consumed in larger portions than fruits and vegetables. It has long since been a misconception that fruits and vegetables are side dishes. It is high time to change the way we think about our meals, and the way we teach our children to eat. If children grow up with good habits they will continue those throughout their lifetime and will ultimately lead a longer healthier life. Fruits and vegetables are great sources for nutrients such as Vitamins A, C, K, and fiber (Fruits & Veggies More Matters). Living a natural, healthy lifestyle will make you and your family much happier. There will be more time for playing outdoors and partaking in fun activities than time spent in a doctor’s office. As the old saying goes, an apple a day keeps the doctor away! Do you eat eggs for breakfast? Add some spinach and tomato to give yourself a quick and easy serving of vegetables. Bring an apple or bag of carrots to work. Have a big salad at dinnertime. Look into a vegetarian or vegan cookbook that utilizes fruits and vegetables in creative ways! ‹ August is Back to School Month!